Jonathan Weisman is a Deputy Washington Editor and Congress Editor at The New York Times. He covered Congress, politics and economics for The Times. His journalism career has taken him from The Oakland Tribune to The Baltimore Sun, USA Today, The Washington Post and The Wall Street Journal before he found himself at The Times. 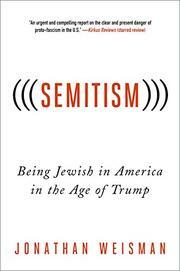 His nonfiction bestseller, (((Semitism))): Being Jewish in the Age of Trump, is a rumination on the rise of anti-Semitism, racism and hate in the era of Trump, and what should be done to confront it. Jonathan Weisman is also the author of the 2014 novel, No. 4 Imperial Lane, which was a Chautauqua Prize finalist, Amazon Best Book of the Month, and Great Group Reads Pick at the Women’s National Book Association. He is the father of two teenage daughters, and lives with fellow writer Jennifer Steinhauer in Washington, D.C. You can follow him on Twitter. A short, literary, powerful contemplation on how Jews are viewed in America since the election of Donald J. Trump, and how we can move forward to fight anti-Semitism. Take a look this interview about antisemitism in America with Jonathan Weisman in Moment Magazine. Check out these reviews of (((Semitism))) in The Jewish Journal, Kirkus Reviews, The Atlanta Jewish Times, Slate, and Publisher’s Weekly. "An urgent and compelling report on the clear and present danger of proto-fascism in the U.S."
"It would be wonderful if anti-Semitism was a European specialty and stopped at the border with the United States. Alas, this is not the case. Jonathan Weisman’s new book (((Semitism))) shows why..."
"A chilling look at anti-Semitism in America in the wake of Donald Trump’s political ascendancy...a thoughtful and deeply personal account." "With eloquence and poignancy Weisman shows how hatred can slowly and quietly chew away at the moral fabric of society. We now live in an age where more than ever bigotry and oppression no longer need to hide in fear of reproach. The floodgates have opened. This is much more than a personal response to the bigotry he experienced because of his Jewishness; Weisman has written a manifesto that outlines the dangers of marginalizing and demonizing all minority groups. This powerful book is for all of us."